I’m taking three weeks to evaluate as I go and come up with a system that will be easily sustainable for us. (Actually, that’s a direct quote!) It’s been almost two weeks and I’m ready to stop the evaluation process and start building our home cleaning plan. I’m not sure what I was thinking, but even two weeks was pushing things for me. Chaos is starting to ensue and I need to figure out a course of action for heading forward. I think I’m closing in on a new system for us that’s going to work out really well. A home cleaning plan is exactly what it sounds like – a plan for how you are going to keep your home clean. It’s not a schedule or a routine; scheduling and routine building come after you formulate your plan. Weekly Cleaning is any cleaning task that needs to be done at least once per week but does not need to be done daily. My old system spread out weekly tasks throughout the week. Vacuuming the whole house one day and dusting the next and so on, but it never really clicked with me in this house. It was a chore to stay on top of that schedule, and while I know home cleaning is a chore, I don’t want my system itself to feel like one too. 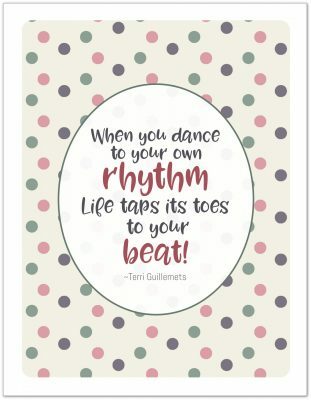 In an attempt to come up with a plan that will work for us, I decided to do what I always do when stumped – make a printable. I think better with pen and paper, whether I’m just doodling as I ponder my problem or jotting down notes and ideas, my scattered brain thinks more clearly when I put pen to paper. So, after sitting and jotting things down for a little bit, I began to realize that I needed to start looking at our current home in a different way. Rather than trying to plan our home cleaning task by task, what if I divided the home into sections? With that sort of percolating in my head I sat down at the computer and started working on a printable. 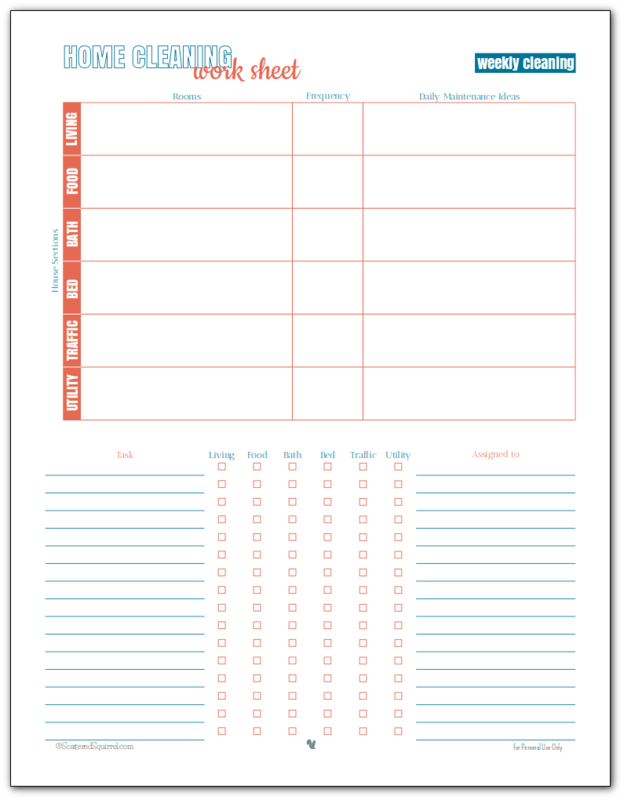 No real direction for this one, I just sort of played around with different things, again, letting my mind wander over the problem at hand, and ended up with this handy little printable I’m calling my Home Cleaning Worksheet for Weekly Cleaning. Each section will contain different rooms or areas of the home, so I left room to jot those down. While each section will need weekly attention, some will require more than a once a week cleaning, so I made sure to give myself some room to make note of anything like that. The last area in the top box is for daily maintenance ideas. These are just ideas for adding little things into my daily routines that might help make the more time-consuming weekly tasks a little easier. Mostly I put that last part in there because I know that as I think about tackling these spaces I’m going to have ideas for ways to make it a little easier. 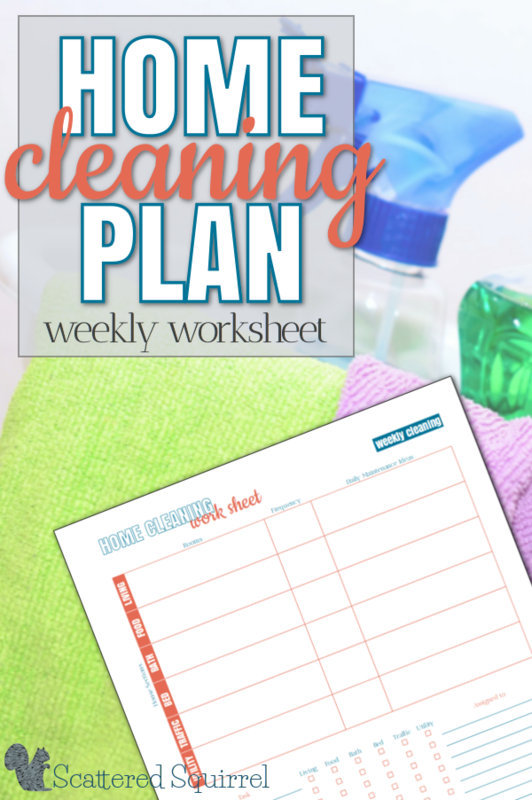 The second half of the worksheet is for figuring out what weekly cleaning tasks need to be done. Things like vacuuming, dusting, disinfecting, laundry (like bedding and towels) etc… Because I know that most of the tasks I jot down will need to be done in multiple sections, I added a check box section so I can keep track. And finally, if you remember from my post a few weeks ago, I suuuck at delegating. To help me remember that I’m not the only one in our family who needs to be helping with our home cleaning, I added a spot to note which one of use will be responsible for what task. This way, right from the beginning I’m making a plan to include the whole family. And I hope that means I’ll stick to it once it’s time to start. Hopefully I’ll some ideas pulled together that I can share with you next week. For now though, I’m off to go hang out with the boys. The sun is shining, the weather is beautiful and I can hear activity outside that sounds like a lot of fun. Until next time friends, I wish you a wonderful day! Do you have a home cleaning plan? How do you tackle weekly cleaning? Previous Post: « Four Simple Steps to Stress-Free Homemaking! – Sign Me Up!!! What a great way to approach dusting. I do something similar with my bathrooms every day, or every two days depending on my time. Those rooms, obviously get a deep clean every week, but I like the idea of doing some quick each day to help keep the house clean and make deeper cleaning a little easier. Hmmm…I have a daily cleaning schedule that incorporates my kids in cleaning… But the more difficult/detailed jobs aren’t getting done. I am not understanding this chart…but if I did, I think it might help me…do you have one filled out? I have one I scribbled all over, but it’s hard to read. I’ll try and clean it up and get it posted on here. Basically, I just used the top section to divide the areas/room of our homes into sections. Each section has a frequency it needs to be cleaned. High traffic areas, food area and bathing areas need to be cleaned more often than say bedrooms do. Then I tried to figure out what could be done daily, or every few days to make the deep cleaning time easier. At the bottom I listed those out, checked off which section they applied too, like mopping floors – I checked off areas that have hard surface floors- then I assigned that task to someone in the house. That way I remember to delegate. Not sure if that helps at all. As I said above, I’ll see about creating a graphic of the printable filled out.